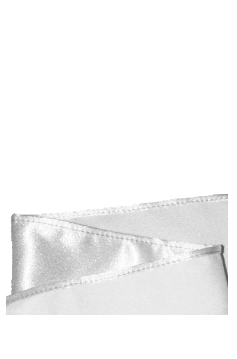 To help you make the perfect wedding dress, Harlequin make and supply all types of fastenings and accessories in your fabric; from Rouleau loops and matching covered buttons, Rouleau spaghetti, fabric piping, bodice eyelets etc. Perfectly spaced and uniform length for a professional finish, supplied on a tape ready to sew into the seam. 30cm x 50cm makes 10 loops with buttons. Spacings available are 11mm, 13mm, 16mm or multiples of those sizes. A “traditional” wedding dress typically has size 18 (11mm) highball buttons with the loops spaced at 13mm. This gives 2mm between each button for a “close-spaced” look. If you have any queries ring us; we’ll need the total length of the opening, size of buttons and spacing. 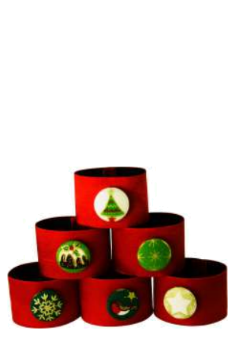 If you are not ordering the buttons from us send a sample for sizing. ready to be sewn in to the seam. State your preferred cord size. 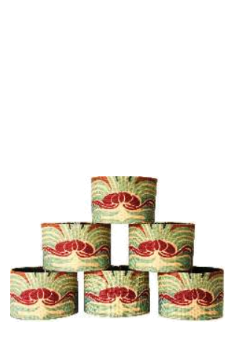 Traditional rouleau spaghetti is made from 4cm bias-cut strips to form a “spaghetti” that is approximately 3-4mm diameter. This is then used either to lace the bodice through eyelets, or else through loops made from the same rouleau. Reinforced suitable for lacing. Colour matched to your fabric or gold or silver. see page 10 for eyelets. NB if you send a complete bodice we will return it by Royal Mail Special Delivery and charge accordingly. 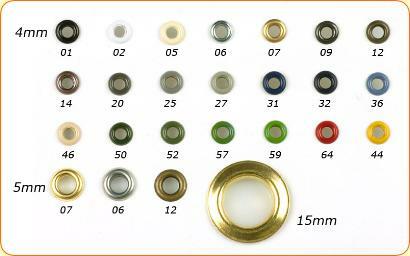 Bodice eyelets – the price is £5 set up charge plus 60p per eyelet. For a more contemporary look go for “flat” spaghetti with loops to match. This is made from 5cm bias-cut strips and the loops look best close-spaced as in the photos. suitable for curtains or similar – in brushed nickel. Eyelet sizes are the internal diameter. NB: Price is for us to fit the eyelet to your garment / item. Dressmaking eyelets are reinforced with a washer on the reverse and suitable for bodice lacing or belt fastening. 4mm eyelets are used in belts and bodices. 5mm can also be used for a larger style. Pictures here show approximate actual size. Quote specific colour number when ordering or we will choose a best match. Note: colours reproduced here may not be a 100% perfect colour match. 3.5cm tall with optional 36”’ button.